A system as complex as your automatic garage door requires an expert's approach whenever something goes wrong. That's what our team is here for, to help you out when an electrical or a mechanical issue rears its ugly head. The springs are in charge of supporting the weight of your door panels. That means they are under a lot of tension on a regular basis, and any repairs or adjustments must be performed by professional technicians, in order to avoid a lot of potential dangers. When these components break, your door will be rendered inoperable, and will become dangerous to handle. Give our experts a call when that happens. We'll replace the damaged components safely and return your door to its perfect operation. Your garage door opener is an electrical device that uses a motor to power the door's operation. As a result, its gears can wear out, and potentially even break. Our technicians specialize in repairing all sorts of opener motor issues, and we can replace any broken gears on the spot. If one or more panels of your sectional garage door have been damaged, whether by a car or by some other type of impact, we can replace the affected panels only. This will be far less expensive than replacing the entire door and our wide selection of panels will help us find the perfect matching parts. Your door will look just as good as ever. 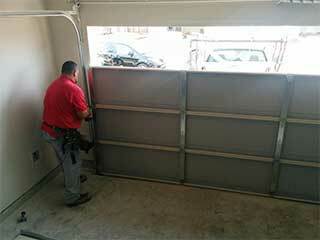 Our experts at Garage Door Repair Arlington can help you with any problem you may be experiencing. There's nothing we haven't fixed before, and our team even provides emergency repair services, for those situations where urgency is of the essence. Call us today.